Sometimes the actors leave no stone unturned to promote their film and reach out to the masses. This usually plays an important role in the success if the film. The Hollywood film Isn't It Romantic is soon going to hit the screens. The film stars Priyanka Chopra Jonas along with Rebel Wilson and Andy Bovine. Priyanka Chopra promoted the film on shows like the Ellen Degeneres's show, Jimmy Fallon's and Good Morning America. The actress also shared the pictures from the same on her social media. 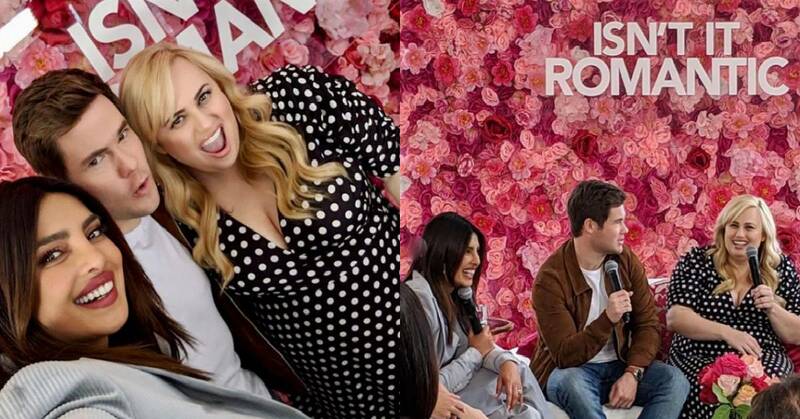 Priyanka also shared some fun pictures with her co-stars Rebel Wilson and Andy Bovine. The trio can be seen interacting with the press in the pictures. Priyanka took a lovely selfie with Rebel and Andy. PeeCee looked stunning in a grey pantsuit with heels while Rebel opted for a black and white polka dotted dress. Andy kept it casual with a white tee, brown jacket and blue jeans. The trio can be seen having some fun time. Their co-star Liam Hemsworth was missing in action whom we completely missed. Priyanka will be playing a yoga ambassador in the film. The film is a romantic comedy. It will be releasing on February 14th, 2019.